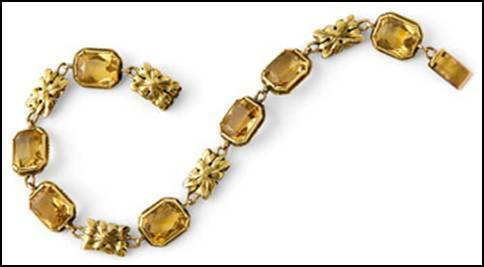 Bracelet, handwrought 14K gold, with alternating links, bezel-set, faceted, rectangular golden topaz with rectangular all gold links in stylized leaf form which are finished in identical way on the reverse. Beautifully crafted, highly detailed and delicate. 6-3/4” L. Unsigned.